1. What is your immediate reaction to this film? 2. What is the film-makers theme? 3. Does the technique of animating people like you might animate a puppet add to or detract from the film? 1. In what way does this change your view of the film? 2. View the film again to notice the subtleties – e.g the newspapers in the opening section, the use of colour in the film, the use of light and shade, the irony of the ending. 3. Would this film have been better shot using non animated people? 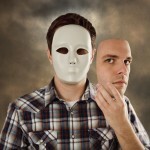 Do you make your own masks to hide something from someone or to gain popularity? Do you make one to hide behind, to cover what is underneath – the real you? Do we make them ourselves or do other people make them for us? If we make them, why do we? Are we so awful underneath, so terrible, that we cannot let other people see? Must we cover up with some other character, not our own, some mask of how we want to be seen by others? Do we mask ourselves, hiding from what we are, even to ourselves? Do our parents, our families, our teachers, everyone we mix with, grasp the mask they wish us to wear, hold us down and force it on, stretching and gluing it on so that it will never come off? Do you always wear it from then on, being as they want you to be? But then you see the mask and what they are doing to you. You try to pull it off, but then, back to the mask for safety. Safe from the hurt and harm; no one dare hurt you while you wear the mask. Do you use different masks for different people? Of course you do. You play innocent at home, good little girl in class, rough and funny in the school yard, shy but outspoken at clubs, rough at weekends. Different masks for everyone you meet and everywhere you go! Scripture Union produced this short film many years ago. It was called In the Bin. What is the message behind this film? This story is like a parable – who might the two characters – Arthur Grimble and the dustman represent? In what ways does the poem below represent ideas contained in the film? The mask I wear is not my own. to try to please everyone. But I ask myself, who am I? But who am I, then? They sit in the classroom like sheep, every one of them. Listening, pretending, acting as if they’re interested. I sit amongst them. I am also acting. Just like everybody else, I am wearing a mask. Smiling when I should be yelling, being polite when I’m so angry that I should be blowing my stack. I wasn’t told why I should do what I was told, only to do it. My mask must remain. Every week until I leave school I must wear it, then I must wear it in the presence of my employer. It’s fate! It’s not me! I hate it! Under My Mask from mneuhardt on GodTube. A mask hides a person’s inner feelings, the hurt, the joy and hate. When people laugh at you, a mask covers up the hurt- it covers it with a smile. Usually in a group, everybody likes and dislikes the same things, while, underneath they all have mixed feelings but are too afraid to voice their individual opinions. 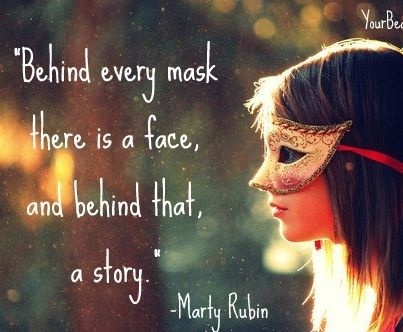 Everybody wears a mask at some time; in a few cases the mask comes on without them knowing it, because it has become a habit. After a while, people become dependent on their masks so that nobody, not even the individual, knows what they are really like, so that their lives become one eternal mask. 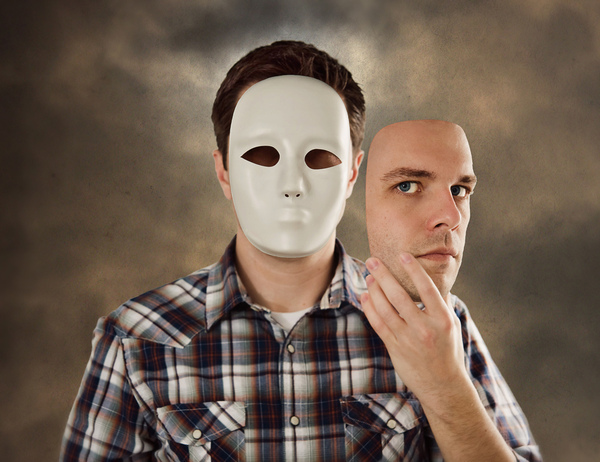 Who am I – do I know who the real me is? I hurt as little as possible. Have the ability to hate. I have a foul temper. This is me without my mask. I hate the mask my parents make me wear – not to drink, smoke or swear. Don’t be seen with that Skinhead, Jim. You know what the neighbours will think! Be well behaved in front of girls and their parents too, for if you don’t, you’ll smudge your father’s name. You should want to be like your father, Jim – famous, wealthy and respected by all the rich, important people in society, the ones that will get you ahead. I wear a mask for my grandma; she created the mask – I didn’t. It is what she wants of me, not what I want for myself. She likes to see me as bright as a button, hair brushed back from my face and a kiss every time I see her. The mask does not fit me, for when I see my friends I don’t kiss them and have my hair brushed back. I can be myself with my friends. They take me as I really am. If they didn’t, they wouldn’t be my friends. My Gran is great – I wouldn’t wear the mask if I didn’t think so. I wear the mask to please her, but it comes off the minute I step outside. Then on goes my next mask for my mum, cleaning my room and drying the dishes. Pleasing her pleases me and keeps me out of arguments. I don’t wear a mask for dad – I just don’t need one, mainly because he doesn’t wear a mask for me. 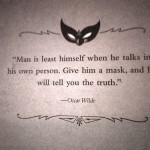 Everything you have read, viewed and heard on this page is designed to get you thinking about the theme of masks and how various people have expressed their views. Write about the following quote by Marty Rubin. This could be in the form of a poem, song, speech, newspaper or magazine article, academic essay, short story. The word length needs to be appropriate to the genre you choose to write in. Is it a bad thing, necessary thing, useful thing or worrying thing to be wearing masks? Isn’t learning to fit into society wearing a mask? Is there such a thing as a civilisation mask?